The Ramayana tells that long ago, Lord Shiva gave his celestial bow to King Janaka. This bow was so heavy and so powerful that no mortal could lift it—except, Janaka discovered, for his little daughter Sita. One day the ball she was playing with rolled behind Shiva's bow. Astonished, Janaka watched his tiny scrap of a girlchild lightly move the enormous celestial bow out of her way to retrieve her toy. That gave him an idea. When Sita was old enough to choose a husband, Janaka decided to hold an archery contest for her swayamvara—the process by which a princess of marriageable age would select a husband from a list of candidates. (Swayam in Sanskrit means “self,” vara means “groom.”) Scores of kings and warriors attended, but no one could even move the bow, let alone string it—except for Rama, whose destiny it was to both wield the bow and to marry Sita. (And who, by the way, had already fallen in love at first sight with Sita, and she with him, so there was really no question of his losing the contest.) 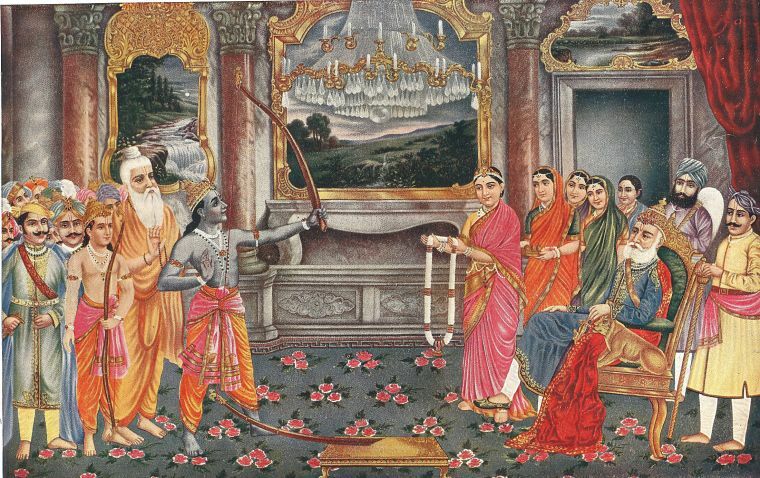 Rama not only picked up the bow and strung it, he drew the string with such force that he broke the shaft. And so, through Shiva's bow, Sita became Rama's queen, and when, after many adventures, both together and apart, their sons were born, it was Sita who taught them to shoot. This bow was so heavy and so powerful that no mortal could lift it—except, Janaka discovered, for his little daughter Sita. This story symbolizes Shiva passing on the practice of yoga to Janaka, who was a perfect master in the age of Lord Rama. Janaka's daughter, Sita, shows her own spiritual power through her ability to handle Shiva's bow; this power makes her Rama's ideal consort, and, eventually, a teacher in her own right. Rama, with his bow, is a symbol of one who has realized the unity of individual and ultimate reality; his bow represents the sustained practice, the sadhana, which makes it possible for everyone to reach that goal. Grasp both toes with the hands [left with left, right with right], keep one leg straight, and draw the other to the ear as you would the string of a bow. This is dhanurasana. The pose thus described is not the dhanurasana that many of us are familiar with— the prone (belly down) backbend, but akarna dhanurasana, whose name comes from the Sanskrit “a” (toward, or near), “karna” (ear), and “dhanu” (bow). Simple though Svatmarama makes it sound, many people find this pose quite challenging to their strength, balance, and hip flexibility. To get a feel for the pose, first work only the lifted leg. Sit with both legs extended straight out in front of you, as in dandasana (staff pose). Flex both feet. Lean forward, hinging at the hips, and catch the outer (little toe) side of your left foot with your left hand, keeping your right leg extended. For now, keep your right hand on the floor near your right hip. Bending your left knee, draw the left foot toward you and lift your leg until your shin is parallel to the ceiling. Now lift your right hand off the floor and use it to support your left heel from the inner (big toe) side. Using the strength of your arms, draw your left knee back until it is just outside your left shoulder. Maintain a 90-degree angle at your knee, keeping the foot high. Lean back as you lift your leg, until you are sitting upright again. Press your right leg down, from the sit bone to the heel. Lift both sides of your ribs and broaden your collarbones. Keeping your left shin parallel to the ceiling, exhale and draw your left knee back. Don't let it drift out to the side; press the outer edge of your foot into your left hand. Now, still holding your left foot, keep the shin parallel with the ceiling, and move your left foot forward as you inhale. Exhale, draw the foot back. “Pump” your left leg like this several times, using your arms to draw the knee back and forward as you breathe rhythmically. Finally, hold the lifted left leg stable, and on an exhale, see if you can draw the knee even a little farther back. Aim to bring your foot level with your ear. Hold for a few breaths, then exhale and release, and repeat on the other side. Now for the full pose! In this version, you will hold your lifted (left) big toe with your left hand and your right big toe with your right hand. Sitting with both legs extended, lean forward and catch the big toes. Wrap the first two fingers and the thumb of each hand around its respective big toe. If you can't reach your toes, or at least not without caving in your chest and rounding your shoulders, wrap a strap around the ball of each foot and hold the ends of the straps. On an exhale, bend your left knee and draw your left foot toward you as you hold your right toe firmly. Keep your legs hip-width apart. Then place the sole of your left foot on the floor, level with or slightly higher than your right knee. Press the entire length of your right leg into the floor. Then, on an exhale, keeping your left knee bent, lift your left foot off the floor and draw your left knee back. Continue to lift your left foot toward your ear. Turn your head toward your right foot; keeping your sight along your right arm, as if you were gazing at the gold center of a target. The right arm is your arrow; the left arm draws the bowstring back. Keeping your focus forward, relax your eyes, your tongue, your forehead, and the base of your skull. Breathe. On an exhalation, release the akarna dhanurasana and repeat on the second side. The Mundaka Upanishad (2.2.4) uses archery as a metaphor for spiritual practice. The mantra Om is the bow. The target is supreme reality, personified as Brahman. The seeker's own self is the arrow. The senses are the string. Pulling back the string—withdrawing the senses from the claims of the sense objects—represents meditation, the process of redirecting energy from external objects to the real goal. With repeated, devoted practice, over time the individual self becomes as one-pointed as an arrow in flight; through that energetic concentration, the seeker hits the target. The sharp focus which leads to a state of union between the individual soul and cosmic consciousness, or God—this is the state of yoga. Pulling back the string—withdrawing the senses from the claims of the sense objects—represents meditation, the process of redirecting energy from external objects to the real goal. Akarna dhanurasana can put us in touch with our tendency to strive. It is challenging, no doubt about it; but do you make it more effortful than it needs to be by gripping your jaw, your eyes, your breath? Explore to find the minimum of effort needed to achieve and hold this pose. When you get tired, which you may fairly quickly, are you content to release the pose, or do you want to cling on, white-knuckled? 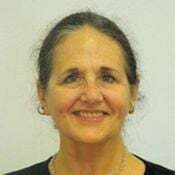 Sthira sukham asanam, Patanjali tells us: “Asana is steady and comfortable.” How does it feel to draw on your full strength and flexibility while maintaining ease? What limits you in this pose—is it arm strength, hip flexibility, something to do with your spine? What actions would you need to take (or avoid) to feel at home in akarna dhanurasana? In practicing this pose, what is your goal? Is it to get your foot level with your ear while keeping your back straight? To maintain calm focus while challenging your sense of balance and flexibility? What is at stake for you in your overall practice? Do considerations about physical performance distract you from the ultimate goal of spiritual union? Let this pose teach you how to be fully engaged physically and to maintain a meditative focus. Beginners: Don't be afraid to fall over the first time or two! Don't apologize for using your strap to lengthen your arm, either. Remember little baby goddess Sita, who didn't let that big imposing bow get in the way of her play, and approach your practice with confidence and joy.